If you’re not opening your second restaurant in DC on the wildly popular 14th Street, you might be doing it wrong. This neighborhood is buzzing with what seems to be a new bar, nightclub, restaurant, or hip retail store opening almost every week. 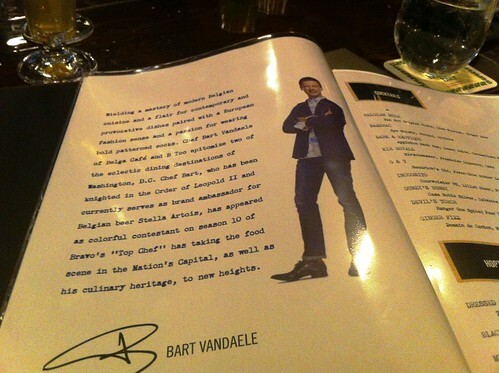 That’s why it is of no surprise that when I was interviewing Top Chef Season 10 contestant, and owner/Chef of the popular Belga Cafe on Capitol Hill’s Barrack’s Row, Chef Bart Vandaele, he mentioned his newest venture would open on 14th Street. Now, this was in January, which means I have been waiting, longing, and drooling for his latest restaurant, B Too, to open their doors. Well, they just did, and not surprisingly at all, Chef Bart and his team did not disappoint. The service, the meal, and the overall experience I had dining recently at his barely week old restaurant was one of the best experiences I have had recently in Washington, DC. Everything, and I mean everything, was perfect. Upon entering B Too, the first thing you notice is the open layout. 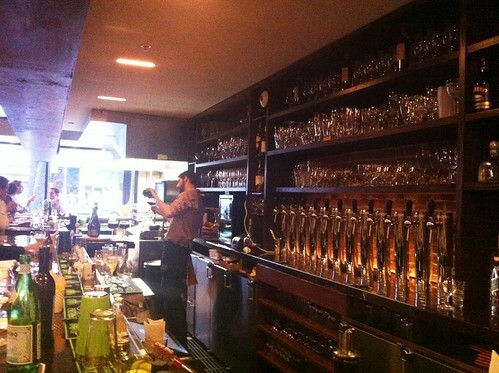 The long, clean bar is just to your left, with a few small tables by the large open window up front. 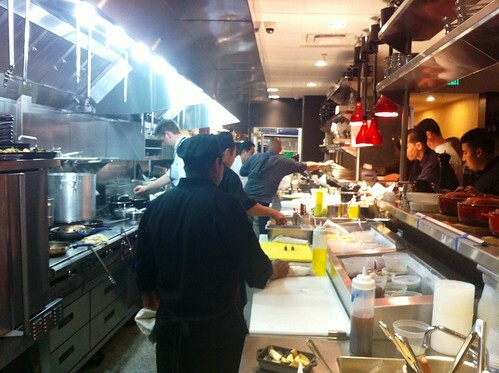 Walking past the bar, you enter the open dining room that is surrounding the open kitchen. There is also a downstairs, more intimate, dining area lined with a exceptional wine display. After enjoying a great Sazerac, and then a beer/liquor cocktail, the ordering began, and seemed to never end, and no one minded. The food is simply amazing. 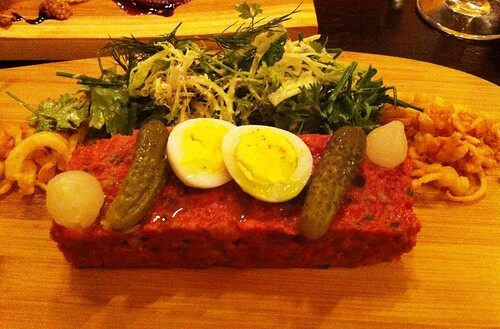 To start, try the the steak tartare. Made with beef tenderloin, a hard boiled quail egg, cornichon pickles, capers, parsley and crispy onions. Served in a large portion with pear onions and a crisp frisee mixed green salad, it’s perfectly balanced. 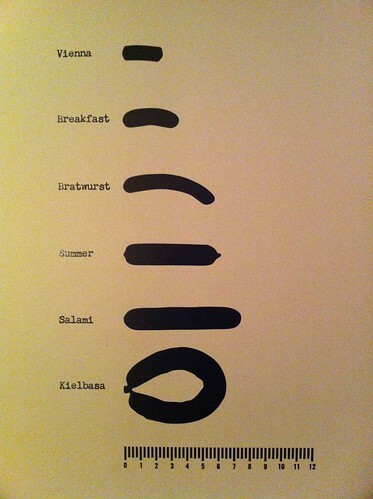 The mustard is just tart enough, and the beef itself is rich, earthy, and has a great mouth feel. Enough to share with two for sure. Balance the rich tartare with something green, make your mother happy. 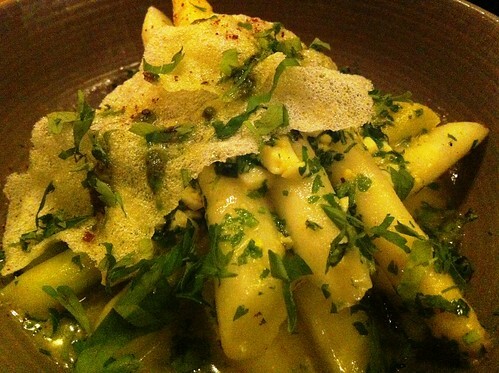 The asparagus is crisp, light, and refreshing. Served in a butter sauce with eggs, parsley, and nutmeg, the dish takes on a very nutty quality while remaining surprisingly light (especially given the butter!). When pork belly is on the menu, order it. 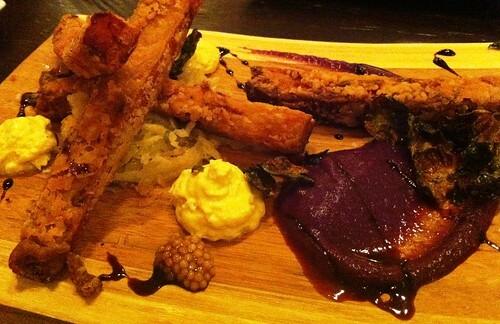 When fried strips of pork belly are on the menu, order it faster. I was so happy that this dish was not dry or over-fried, rather the exterior was perfectly crispy and not greasy, and the pork on the inside was tender, moist, and perfectly cooked. Served with cabbage, mustard, butter (of course) and a sweeter fruit-based sauce, this was one of my favorite appetizers involving pork I’ve ever had. Imagine fries…but with pork…pork fries! Of course, being a Belgian restaurant, and the fact that these are likely the most trending food item this year, Brussel sprouts were ordered. 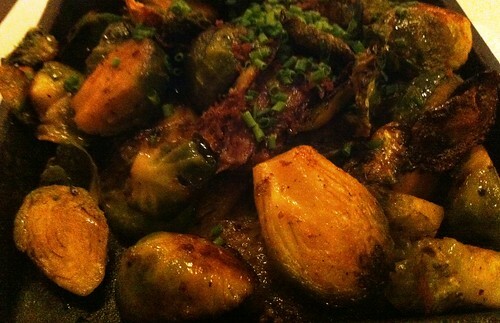 Cooked with bacon lardons and onions, as they should be, the sprouts were cooked perfectly – firm but tender, not overcooked, just simply prepared and delicious. The entree dishes all looked amazing, and to start the rabbit prepared for two people was ordered. Coming in a large dutch oven to the table, the herbs, rich sauce, and vegetables lightly still simmered in front of me. The rabbit, I learned, was cooked in several ways. The legs and thighs were sous-vide, where the breast was seared and baked leaving the skin crispy. 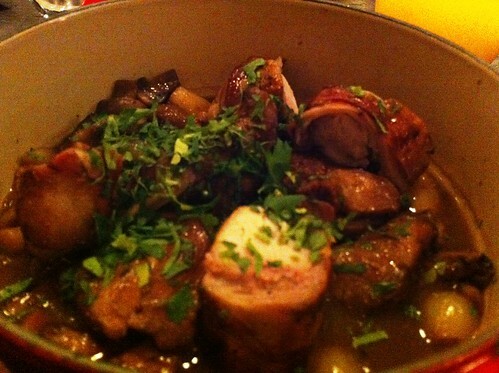 Easily some of the best rabbit I have ever had in a restaurant. 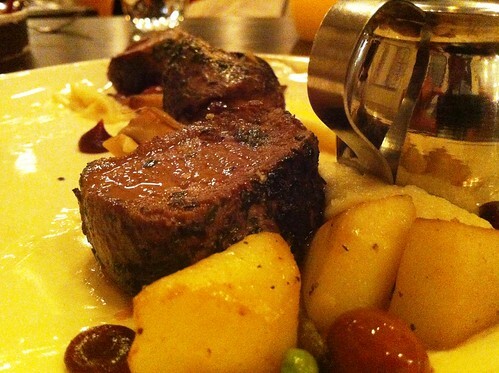 Sticking to wild game, the venison was ordered and devoured. Seared fillet medallions were cooked with fresh herbs, couscous, raspberry beer, parsnips and dark chocolate served over light, whipped potatoes. Perfectly medium rare and tender, the chocolate complimented the sometimes gamey meat well. 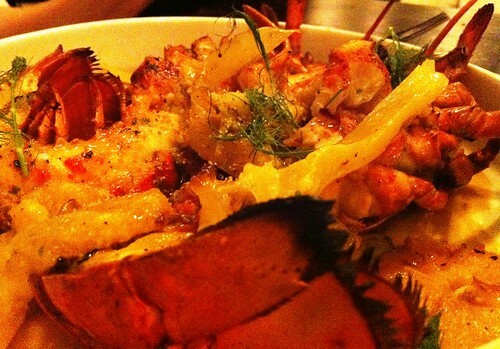 The last entree tried was the oven roasted lobster with a five-spice butter and fennel. The lobster was sweet and succulent, cooked perfectly, and melted in your mouth. The rich butter and the sweet lobster provided for a very decadent dish – personally, some orange or lemon zest, or some type of citrus would have been nice to cut the rich dish. A perfect night is the only way to describe it. The decor was thoughtfully purchased, care was taken (to the tune of a $60,000 custom noise reduction) to reduce echos and make the area much quieter than it should be, and the food was amazing. But the creativity of Chef Bart and his team didn’t stop there. 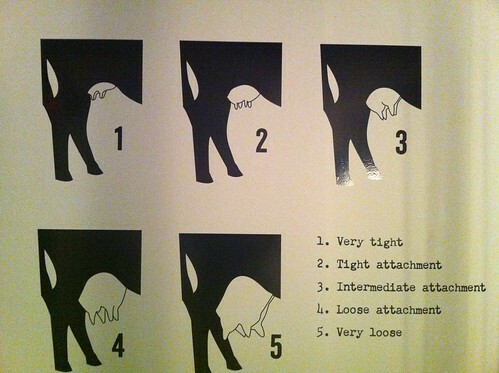 Check out the bathroom art below. Move over Golden Arches, Sixth Engine brings their MacRib back to DC!